Vast Public Indifference: Happy Birthday, Abraham Lincoln! 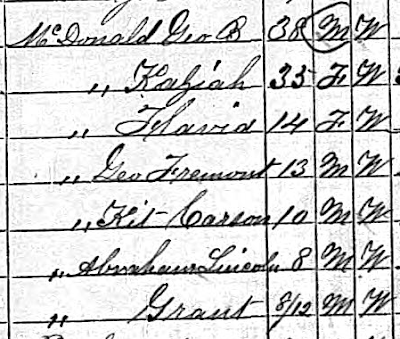 In honor of Lincoln's 200th birthday, I bring you my two favorite namesakes from the 1870 census. George and Kaziah McDonald named all of their sons after famous men. Thus, we have George Fremont McDonald, Kit Carson McDonald, Abraham Lincoln McDonald, and Grant McDonald. 4-year-old Abe's occupation listed as "Hurrah for the Union"